GLP Atoms are used to key light the performers and bathe the room in blue. Churches have undergone dramatic changes prompted by the growing appeal of contemporary worship services in America. Young parishioners who once joined their parents in traditional church settings in static white light are now being welcomed by a new generation of church leaders and ministers with immersive visual designs that make use of LED walls, pixel tape, moving heads and color-mixing LED washes. Concert-style seating and lighting and audio systems driven by sophisticated lighting and audio consoles are replacing hard wooden pews, stained glass and pipe organs. Elation Pixel Bars used in a silhouette look. Even more radical are the houses of worship where a permanent “house” does not exist, and instead, people gather in a middle school auditorium or community center rec room. A case in point is Radiant Church in the Kansas City area. For two years, David and Renata Perkins have been welcoming worshippers to regular Sunday services at Overland Trail Middle School in Overland Park, KS and Wednesday evening gatherings at Tomahawk Ridge Community Center in Overland Park, KS. Perkins, who had 16 years of youth ministry and outreach experience before venturing forth with this project, got an assist from ARC (Association of Related Churches), a “church planting” organization that’s affiliated with Birmingham, AL-based Church of the Highlands. Along with seed money, ARC has been supporting and nurturing Radiant Church’s growth with the services of Brighton, MI-based E2i Design (e2idesign.com). 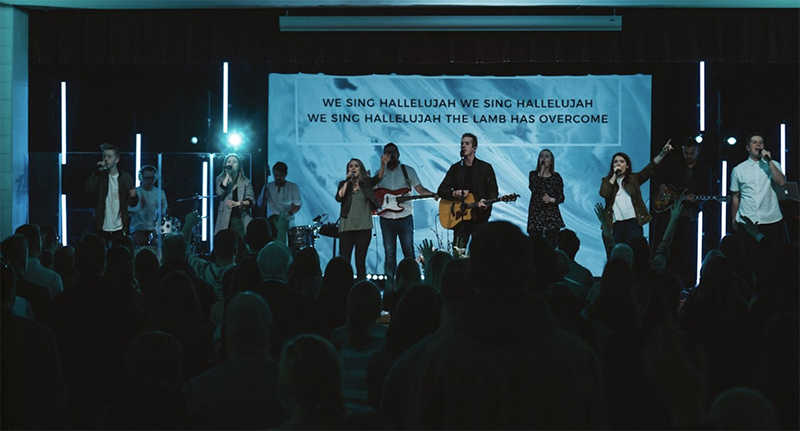 E2i founder and CEO Josh Holowicki, who has worked on church visuals “all over the world,” is often tasked by ARC to provide the kinds of immersive visual designs that help newly established church services attract and retain a bigger following. As Holowicki notes, the process of “church planting” begins when ARC notices regions where residents have been receptive to streaming religious broadcasts through internet analytics. Because actual services can form a deeper bond with followers than an online streaming service, ARC will often provide “seed money” to help establish a portable campus in a promising location. The ultimate goal is for the portable campus to emerge as a permanent church location – and for the reimbursed seed money to support portable worship services in other promising and under-served areas. An Eiki 12k projector is used for the background imagery. 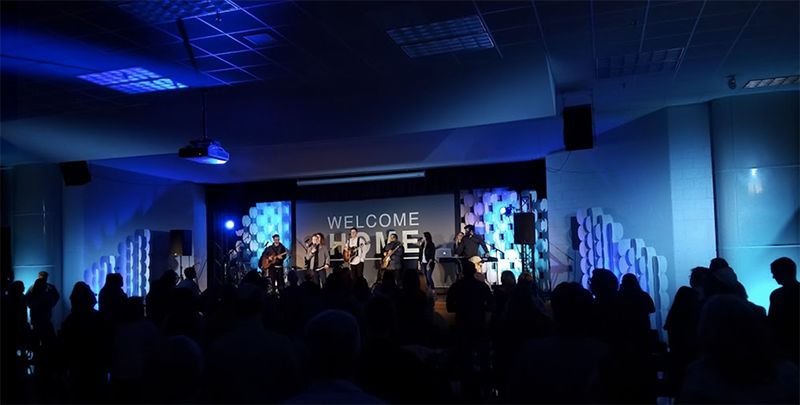 For Radiant Church and similar startups, Holowicki focuses not just on producing a knockout visual design, but to do that with a setup that can be installed, operated and struck as efficiently as possible – all while keeping costs to a minimum. When you have a production department in a congregation that may be composed of a leader and several volunteers with varying levels of experience, with the time constraints of a touring gig, what’s the best way to solve that equation? But the challenges don’t end there. Portable church services are held in places with limited space and hanging positions and constraints on power distribution and storage, Holowicki notes. For Radiant Church, however, he was able to overcome all those hurdles with an array of fixtures from GLP, Elation and Harman/Martin’s Rush series. Along with “regular workhorse fixtures,” he chose the portable arsenal of gear to ensure that everything was “portable and easy to install,” while also impressing worshipers with eye candy. Holowicki chose GLP’s X4 Atom for its compact size and versatility, with an impressive feature set that includes a quad-color LED chip onboard and a 9:1 zoom range. That gives Radiant Church the ability to have a good stage wash, tight beams for aerial looks and accent and a bright, full-spectrum beam from such a small fixture body. In addition to two dozen X4 Atom luminaires, E2i Design created a projected background, a backlight system, key light towers, lots of visual eye candy, all easily set up weekly by the church’s production staff. The background is projected from an Eiki 12K projector using a short-throw lens onto a Da-Lite Fast Fold screen; just in front of that are the Elation SixBar 1000 units providing more color and visual interest from a low angle, mounted on the deck in front of the background. On truss towers across the stage deck are the Elation Pixel Bar 40 units with the tube lens accessory for that smooth, yet pixelated video bar look; a Martin M2GO console controls the rig. The background content is coming from a simple combination of a Mac computer and Pro Presenter, which is simple and robust, a good choice for an all-volunteer production team. For general illumination and punch, Holowicki chose Martin’s RUSH series MH6 CT moving head units and the RUSH PAR2 RGBW for backlighting and color accent. RUSH MH6 units have a variable white color temperature from 2700K to 7800K for high visibility, accent and tuning for camera as well as dynamic cueing to heighten the message; the PAR2 RGBW fixtures provide that intense color pop to bring the entire system together with the projections. Both Martin fixture types have an impressive zoom range, allowing the church to use them for beam looks and wash utility quite easily. After studying religion at Bethany, OK-based Southern Nazarene University, serving for 14 years as a youth pastor at New Life Church in Colorado Springs, CO and two years as senior director of Every Home for Christ International, an outreach organization also based in Colorado Springs, David Perkins, his wife, Renata, and their four young children traveled to several cities in the American Midwest, looking for opportunities to serve. After prayerful reflection, they felt a call to settle in Kansas City, and after hosting prayer meetings in their new home there, their newly formed Radiant Church held its first service at Overland Trail Middle School in Overland Park, Kansas on Sept. 18, 2016. The middle school continues as the primary meeting spot on Sundays for Radiant Church, with services at 9:30 and 11:15 a.m. Radiant Church also holds services on Wednesday evenings from 6:30 to 7:30 at Tomahawk Ridge Community Center in Overland Park, KS. Along with the inspiration and fellowship that includes free coffee for adults, Radiant Church offers its Radiant Kids program for infants (four months old) to 11-year-olds, with a safe, supervised play and learning environment on the same premises as its religious services. The church also offers a Next Steps program of classes designed to deepen the followers’ understandings of the church teachings with an opportunity to get involved with one of the church’s ministry teams.